To embark on its next chapter in human space exploration, NASA has created a new department to oversee manned spaceflight in the post-space-shuttle era. The department is called the Human Exploration and Operations Mission Directorate, and combines two previous organizations, the Space Operations Directorate and the Exploration Systems Mission Directorate. The reorganization is part of top-to-bottom changes moving through the space agency, which finds itself at a turning point. This year NASA retired its 30-year-old space shuttle program, which was the focus and most visible part of its activities over the last few decades. The agency is now gearing up for an era of human missions to deep space, including trips back to the moon, then on to asteroids and Mars. The new Human Exploration and Operations Mission Directorate will be responsible for overseeing all this and more. "America is opening a bold new chapter in human space exploration," NASA Administrator Charles Bolden said in a statement. "By combining the resources of Space Operations and Exploration Systems, and creating the Human Exploration and Operations Mission Directorate, we are recommitting ourselves to American leadership in space for years to come." While NASA is targeting human missions farther out into the solar system than ever before, it hopes to pass on the torch of low-Earth orbit travel to the private space industry. 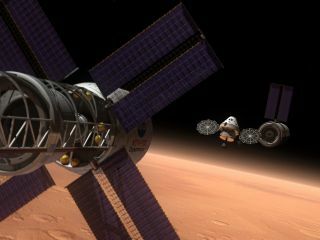 The new office will oversee NASA's Commercial Crew Development program, which aims to stimulate the development of private spacecraft to carry people to orbit, as well as the Commercial Orbital Transportation Services program, which does the same for cargo. Meanwhile, NASA will continue operating the International Space Station. Until private spaceships are ready, U.S. astronauts will rent rides to the station aboard Russian rockets. The orbiting laboratory is planned to run through at least 2020. This, too, will be supervised from the Human Exploration and Operations Mission Directorate. Associate Administrator Bill Gerstenmaier, previously the associate administrator for Space Operations, will head the new office.